"There have been many alleged revelations of God. There have, indeed, been many Gods as there have been many Bibles... Hidden Gods - no Gods - all we see is man's poor guesswork." "As a work of literary value [the Bible] is surpassed by everything written in the last two thousand years by authors even of the second rank,... Its conception of the universe is childish, and its morality revolting..."
"As to Jesus of Nazareth, my Opinion of whom you particularly desire, I think the System of Morals and his Religion, as he left them to us, is the best the World ever saw, or is likely to see." 10.1 Why don't we just have one translation? B.) all translations are equally inaccurate because they continue to read differently over the years. So which is the answer? Clearly if the Bible was intended to make concrete statements, accurately record history, and convey absolute values, then it cannot be subject to completely relative interpretation. But does this then leave us with a host of different translations, not one of which stands as the unchanging truth? Why don't we just have one translation? All things being the same, there should be only one Bible. Unfortunately, all things do not remain the same. Truth and the message of the Bible stands immutable over the ages, but languages and colloquialisms have not remained so static. Terms, phrases, even whole languages have fallen in and out of use. If everyone were well versed in ancient Greek and Hebrew, translation would be much less of an issue. But once we demand a Bible constrained to the dialect of our day, we must approach carefully the book we are handed in return. 10.2 The nature of language. Ancient Greek writing was an extremely precise language which, by comparison, leaves English to appear quite ambiguous. In English, for example, the phrase "I think Peter can" conveys different ideas depending on which word we emphasize. "I think Peter can" asserts our confidence in Peter, whereas "I think Peter can" asserts doubt as to whether he can or not. Greek does not suffer from this same shortcoming. Thus what might appear open to interpretation in an English translation may, in truth, be a clear pronouncement in its original form. For just this reason, English readers need a translation that has faithfully reproduced the original message in its fullness of meaning. Our concern should be with knowing how to evaluate the trustworthiness of English translations. 10.3 From one language to another. Suppose you were a patient on an operating table and your surgeon had to perform a certain procedure that is only described in a special textbook written in German. He then presents you with a stack of books, each of which is a different translation of the German textbook, and asks you to approve one. Short of asking if there is a German doctor in the house, how do you select the most accurate translation? Some editions might be translations of other translations; many times removed from the original. Perhaps others were taken directly from the German textbook, but with the questionable aid of antiquated dictionaries. Still other translations might even have been furnished by pharmaceutical companies whose deceptive alterations could sound very much like the original, but with just enough spin to favor the use of their own specialty products. Such are the perplexing issues that complicate selecting the best English Bible translation to read. Who was the translator? Was it one person or an organization? What were their intentions; easy reading, or word for word reproduction, or support of their personal ideology? 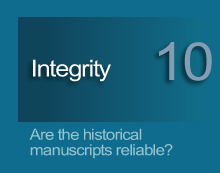 And what knowledge of ancient manuscripts did they reference: a few copies, or thousands of copies, or none at all? 10.4 The most popular English translations. The Tyndale Bible of 1525 was the first New Testament to be printed in English. Of equal importance was the fact that it was the first to be translated from the Greek instead of Jerome's Latin Vulgate. 3 Tyndale followed with parts of the Old Testament in English, but fell victim to the Inquisition before translating the entire Bible. The King James Version (KJV) was to become the first popular edition in English. This work was set in motion by King James and performed between the years 1604 and 1611 by fifty-four translators. This is also called the Authorized Version, but no official endorsement of the finished product is recorded. Though a fairly accurate work and an admirable feat for the time, the reference manuscripts were few and of relatively late origin. For the New Testament, translators had the text of Erasmus as revised in 1551. For the Old Testament they had the Complutensian Polyglot (1517) and the Antwerp Polyglot (1572). 4 The translators were aware of this limited manuscript base and even stated their concern in one preface to the KJV. The most obvious difficulty of the KJV is understanding the Old English in which it was written. While it may have made perfect sense in 1611, it almost reads like a foreign language today. In the KJV, we read for example, "The noise thereof sheweth concerning it, the cattle also concerning the vapour" (Job 36:33). Compare this to a 1978 translation: "His thunder announces the coming storm; even the cattle make known its approach." The Revised Version (RV), begun in 1870, was largely a British effort to modernize the outdated wording of the KJV. Taken into consideration were the recovery of the Codex Sinaiticus and Vaticanus; copies unavailable to the KJV translators. American scholars were invited to participate in the translation although they worked independently of their British colleagues. The RV was finished in 1885, followed shortly by an American rework. This American Standard Version (ASV) of 1901 featured American dialect over British dialect, re-paragraphed the verses, and placed verse numbers within the paragraphs. The Revised Standard Version (RSV) was produced from 1937 to 1952 by thirty-two scholars from twenty universities and differing theological schools. It was the first work to have access to the Dead Sea Scrolls, Codex Washingtonianus and the Chester Beatty Papyri. The RSV was an attempt to revise the wording and style of the ASV while retaining the flavor of the KJV. More archaic expressions were replaced with modern ones, though the translators chose to retain Old English pronouns and verb forms in cases where divinity was addressed. The New American Standard Bible (NASB) was prepared by fifty-eight scholars and released in 1970. The stated goal of this translation was to be true to the original Hebrew and Greek as well as be grammatically correct. As such, the NASB, a formal equivalence translation (FE), attempts to duplicate the original language word-for-word. It even duplicates the original word order in English to the extent that good syntax allows. The NASB translators also referenced the Dead Sea Scrolls and had available the Bodmer Papyri recovered in the 1950's. The NASB reverts to printing each verse as a separate paragraph as did the KJV, but unlike the ASV. There has recently been released an updated version of this translation you will find abbreviated as NASB-U. The New American Bible (NAB) was the next American Roman Catholic translation. It was produced by fifty scholars over a twenty-five year period; five of whom were Protestant contributors. The NAB, finished in 1970, is considered to be more faithful to the original text than the JB. The New World Translation was prepared by anonymous persons under F.W. Franz for the Watchtower Bible and Tract Society from 1950 to 1971. It was designed for use solely within the Jehovah's Witnesses organization. The NIV is considered a dynamic equivalence translation (DE). It is less rigid in its rendering of the original language structure than an FE work like the NASB. A DE seeks to balance a fluid readability with accurate reproduction. Because of this, the NIV is fairly easy reading, consistent in its use of contemporary vocabulary and is currently the best-selling English translation in the world today. The NIV is also the translation distributed by The Gideons International. One of the more recent works is the World English Bible. This is a public domain translation of Scripture based on the ASV, the Biblia Hebraica Stutgartensa Old Testament, and the Greek Majority Text New Testament. Available for free download here, it is in draft form and, according to its site, is "currently being edited for accuracy and readability. The New Testament, Psalms, and Proverbs are close to how they will read when they are finished, but most of the Old Testament still contains some archaic grammar that will be revised." Works which compete with popular translations and paraphrases include study Bibles. These are typically one of the above works with the addition of maps, introductory paragraphs to each book, linguistic helps and sometimes personal insights or opinions by a particular writer or scholar. Such Bibles have included The Open Bible, The Hebrew-Greek Key Study Bible, The New Scofield Bible and the Ryrie Study Bible. Further additions to the existing Bibles available are ones paraphrased heavily in African-American slang, a Reader's Digest condensed version (under the editorial direction of Bruce Metzger), and several others in various degrees and flavors of colloquial English. NEXT: What are the Apocrypha and psuedepigrapha? After considering the writings' transmission, but before looking at interpretation, lies the subject of translation. If we are confident the early documents are faithful copies of the original words, an answer is needed as to why there are so many different translations circulating today. 1. Why not one translation? 2. The nature of language. 3. From one to another.